A note from the Editor: It is with great pleasure that I present to you a labor of love and wonderful tutorial from one of our new contributors, Andy! 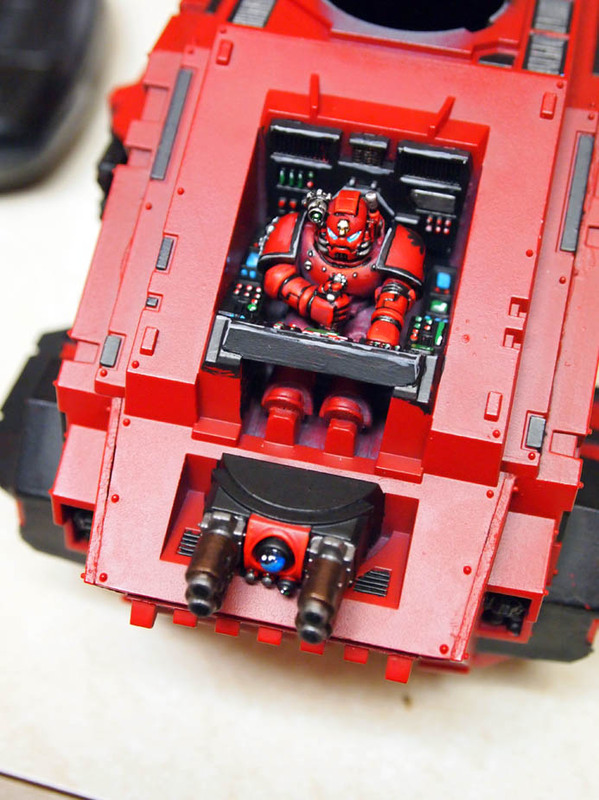 This complete tutorial features his fantastically painted Blood Angel’s Stormraven which he slaved over in the beginning of 2011. The original tutorial, which can be found on Andy’s blog, was delivered over nine parts. Andy has been gracious enough to recreate that tutorial here, slightly condensed, for you, the Turn 8 audience (also, it gives some better exposure to his work … win/win!). Please enjoy and feel free to leave our man a comment or two. In this installment, I’m gonna go over the icons I used for extra decoration. 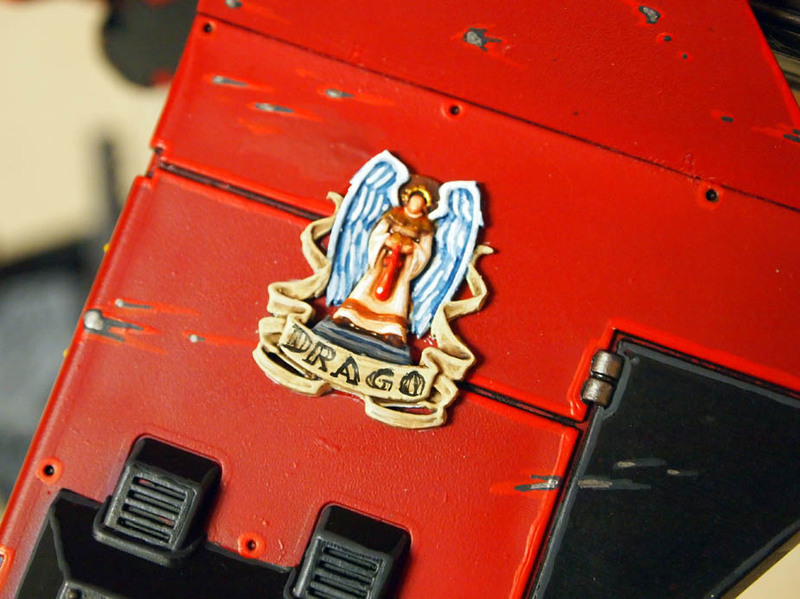 First off, the Stormraven comes with plastic relief icons of the basic Blood Angels “winged blood droplet”. I used one of these on the front right of the vehicle, but I also had some left over Blood Angels icons from the Baal Predator kit. You can also buy these icons separately at a bits store or eBay. The first icon I’ll go over is the angel dropping blood from a chalice on the left wing. For all the icons I used a white base coat to make the colors really pop and the fact that the colors were mostly whites and light colors. I painted the scrolled portion and the angel’s garment Bleached Bone. I kept the wings white and used Blood Red for the actual blood droplet. I used Dwarf Flesh as a base for the face and highlighted with Elf Flesh. For the gold crown I used Shining Gold and then a Burnished Gold Highlight. After all the base colors were painted, I washed the wings with Azurman Blue Wash and then highlighted with Bone White. For the scroll portion and garments and used a Devlan Mud wash and then Highlighted again with Bleached Bone. I highlighted the blood droplet with Blazing Orange and then Skull White for the specular reflection. I then used Chaos Black and a very fine brush to put in the text. 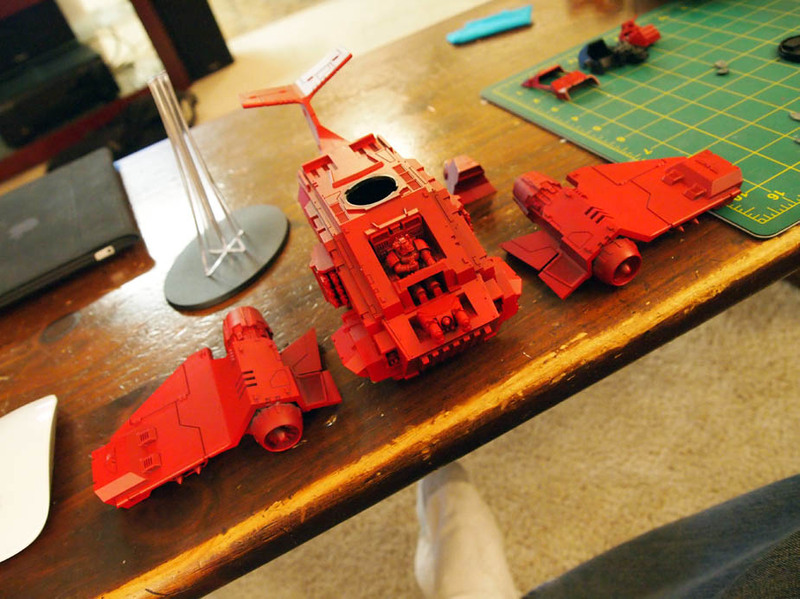 In the next part of Build a Stormraven, after priming everything Dragon Red and magnetizing the wings, I started to paint the details on the ship. First I put a base coat of black on all areas that I wanted to be black or Boltgun Metal. The black areas are meant to create a sort of visual rhythm (a series of light-dark-light areas), too often people will paint a model all one color and call it a day. The first parts that I actually wanted to do finished detail work was the cockpit, top turret and top intake vent so I could glue the canopy on the cockpit and glue together the top turret. I used Blood Red as the pilots highlight color and a 1:1 mix of Codex Grey and Black to highlight the black areas. For the buttons and control panels, I use a variety of colors (blue, green, red) and just highlighted them with a quick dab of white. 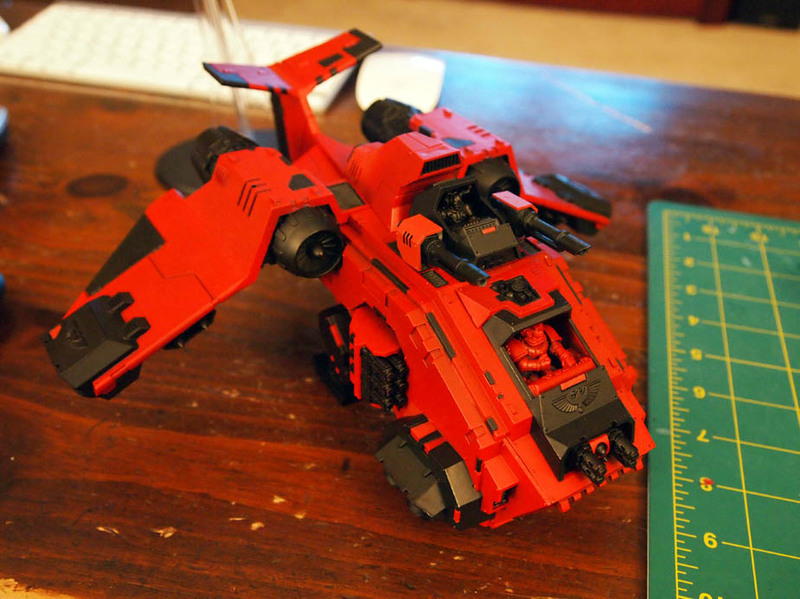 For part two of how to build a Stormraven, I have my Stormraven primed with Army Painter Dragon Red spray paint. For those used to GW’s primers this spray paint is a rather different animal. Its a thicker paint out of the can and a bit more touchy than GW’s. Make sure the humidity is not above 50-60% when you are painting and also make sure its not too hot or cold out, I’d say no hotter than 85 degrees and no colder than 50 degrees. 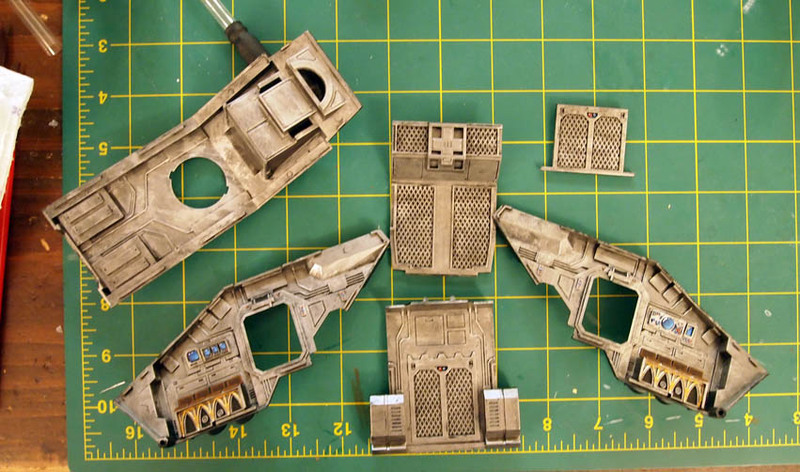 Also you will have to spray a bit closer than GW cans, which are generally best at about 6-8 inches from nozzle to model. Make sure the Army Painter nozzle is about 4-5 inches away from your model. 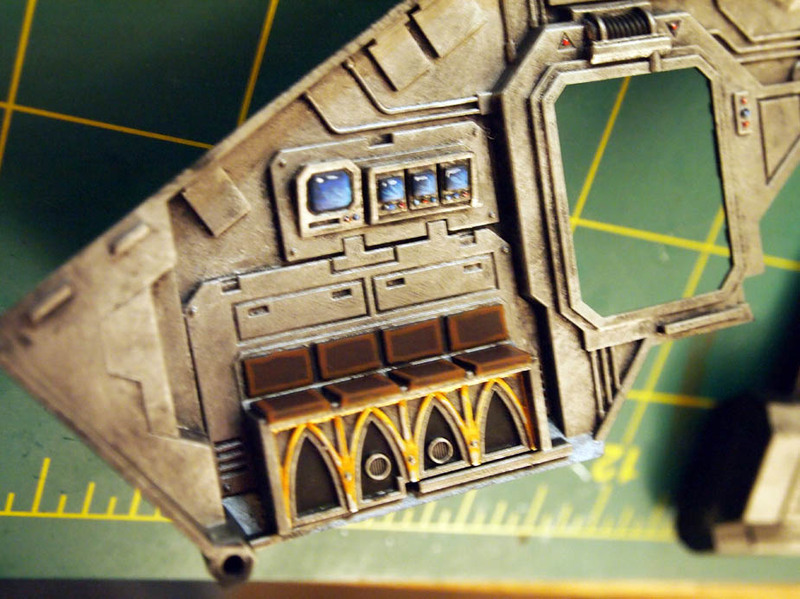 If you get further you run the risk of the paint drying before hitting the model and this creates a sandpaper like texture. If you paint on a hot humid day (or on a rainy day), you’ll also get this same sandpaper texture. Even with all these high maintenance instructions, I HIGHLY recommend priming with Army Painter sprays. Their selection of color is fantastic and for the most part, color matches GW’s line of paints. I also used the Skeleton Bone Spray paint (matches GW’s Bleached Bone) to prime all my Tau army. In the last podcast you heard me mention the use of a styrofoam cutter so I thought I’d write up a little tutorial on how to do that. I dug around my house and found a few scrap pieces of foam and decided to build a quick modular hill. I gathered some foam, the cutter, flock grass, white glue and some grey primer. Using the cutter I went around the foam pieces and held the wire at a 45 degree angle. As I was cutting I moved the wire in random up and down movements until I cut out the entire piece to give the hill a nice rocky look. I did the same thing for the rest of the foam pieces. You may want to stack the foam pieces a few times and cut them again to make sure they look good stacked on top of one another.